Introduce young readers to division with this engaging title! Knowing how to use division makes planning a camping trip much easier! 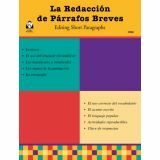 This Spanish-translated book will excite readers by using practice problems, vibrant images, and helpful mathematical diagrams to improve their division and STEM skills. Meet a family of three who makes 12 smores, then divides 12 by three, giving each family member four smores! Meet five friends who have ten hot dogs, then divide ten by five, giving each friend two hot dogs! 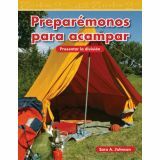 Division can help families and friends make things even on a camping trip and can help children in daily life. 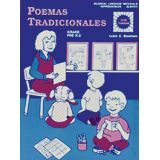 25 reproducible Spanish poems with follow-up activities to enjoy and to engage in a variety of thinking skills. Do you think a snake would make a good pet? 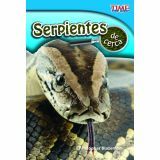 This fact-filled, Spanish-translated title uses bright, vivid images in conjunction with descriptive and informative language to let readers decide if they think these cold-blooded reptiles would make good pets. 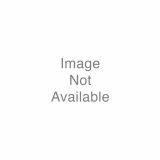 The multi-colored books deal with miscellaneous subjects such as: vocabulary development, language exercises, editing paragraphs, rhyming words, number rhymes, spelling, and poetry. Grade Interest Level: 3-12. Frederick G. Frog is the greatest frog in all the forest! Whimsical images and easy-to-read text, translated in Spanish, take young readers on a journey with Frederick through the forest as he cites all of the things that make him special. In addition, Frederick asks children to think about what makes them special. 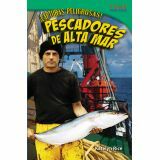 Through bright images, charts and graphs, and informational text, this Spanish-translated nonfiction title provides readers with enlightening facts about what it takes to work in this exciting and unique profession. Featuring a glossary of terms, an index, a list of helpful websites, and an interview with a real-life deep sea fisher, children will be engaged from cover to cover! A vain emperor is put in an embarrassing situation when two tricky tailors take advantage of his vanity and make him clothes that are supposedly only visible to people who are fit for their jobs. Unwilling to look incapable by admitting that he sees nothing, he walks in a parade in just his underwear! Luckily, a bold child tells the truth about the emperor's new clothes. This script features roles translated into Spanish and written to match different reading levels, supporting differentiation and English language learner strategies. By utilizing differentiation strategies, teachers can assign specific roles to their readers based on everyone's current reading level. This feature allows everyone to get involved in the same activity and feel successful! All readers can gain confidence in their reading fluency through performance, regardless of their current reading ability. While performing with others, students will practice interacting cooperatively, reading aloud, and using expressive voices and gestures to better tell the story. This script also features an accompanying poem and song to give readers additional fluency practice. This dynamic, colorful script is the perfect tool for a classroom of diverse readers. It will surely get everyone participating and confidently practicing fluency! Who is on the playground today? Children will take a short trip around the different pieces of playground equipment to see who is on the playground. 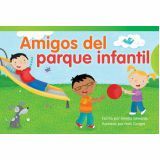 In this Spanish-translated book, young readers will see lovely illustrations of a diverse range of boys and girls playing together on the playground and easy-to-read font that will help them read each name. 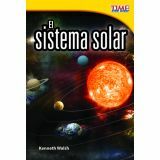 Explore our solar system and Earth's place in it as readers flip through the pages of this Spanish-translated nonfiction title. Featuring vibrant images in conjunction with accessible charts and diagrams, readers will be fascinated from cover to cover! You can count many things around you. Read this book to see ways that you can count things every day. 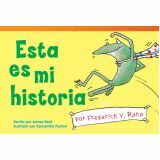 This book has been translated into Spanish and allows for a wonderful shared reading experience for children who are beginning readers and is an excellent tool for building the confidence new readers need to embark on the adventures that await them while reading! Practice graphing while cleaning up the school! 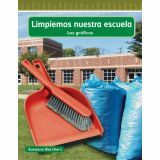 In this engaging title, that has been translated into Spanish, a summer storm leaves the school in a mess, so students work to clean it up. Young readers can practice their graphing and STEM skills by creating graphs of the items collected to determine what needs to be recycled. This book improves graphing skills and encourages students to help their schools in any time of need! With vibrant images, simple examples, clear charts, and helpful mathematical diagrams, this book will make children confident in their graphing skills.